In case you haven’t noticed my last name is Fear (yes, it was certainly an interesting name to grow up with). And in case you haven’t noticed, I also have a new blog, Fearless Eating, a more apropos name than the previously named blog which was, well, just…Blog. I think the new one is better, don’t cha think? And to celebrate the birth of Fearless Eating, I’m announcing my first-ever giveaway! Keep reading to learn how to sign up for three prizes valued at over $170. 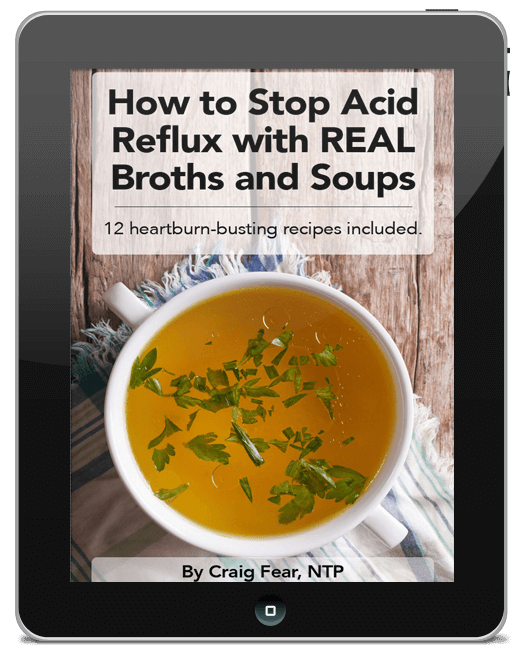 Three lucky winners will get some great real-food resources. 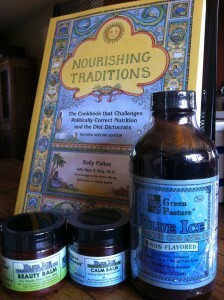 The first winner will win a copy of my all-time favorite cookbook, Nourishing Traditions by Sally Fallon, along with a bottle of Green Pasture fermented cod liver oil AND Green Pasture’s two newest skin care products, Calm Balm for achy joints and muscles, and Beauty Balm for dry skin. That’s a $97 value! For the photo, I included the non-flavored version of the fish oil, but winners can choose from any of the other three flavors, cinnamon, orange and mint. 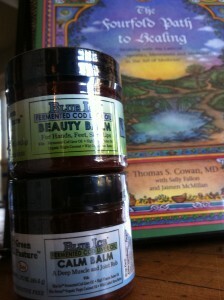 Second prize is a copy of The Fourfold Path to Healing by Dr. Thomas Cowan as well as the skin care products valued at $51. And the third will win the skin care products pictured above valued at $26. There are five ways to register, each one qualifying as an entry. So you can have up to five chances to win! The most fearless thing I’ve ever eaten is…. The most fearless thing I’ve ever eaten is a pork tongue. And yes, it was horrible. It tasted like a Nerf football soaked in dirty rain water. Of course, I cooked it completely wrong but the memories of it are so unpalatable that I don’t think I could ever try it again. I should also say that while the dining hall concoction of ketchup, salt and Coke your college friends dared you to inhale will qualify as an entry, I’m looking more along the lines of traditional foods. You know, like something exotic you tried while traveling overseas like fried crickets or say, fermented fish heads. And don’t worry, if your eating hasn’t been very fearless, you can still enter the contest. OK, your turn. Let’s hear it! 3) Use the widget below to complete your entries. You must be signed up for the newsletter to qualify for the other four. Note: putting your name below does not automatically sign you up for the newsletter. You must do it manually on the upper right side of this page first.